Feeling like taking a break for some fun times with friends and the fam but don’t feel like doing the planning? There are a whole bunch of resorts around town that dot our highways that you can check out for some heavy TLC be it for a day, or over the weekend. Call your bffs or loved ones, pack your bags (or not) and head over to one of these resorts on Bannerghatta Road. As the name suggests, they’re an ecological conscious resort. They offer both over night and day packages customised to the number of people visiting and what you’re looking for over the course of the day. It’s great for big groups and families (or events) if your idea of fun is the excitement that comes with competitive sports and games. They also have a pet zone where your furry buddies can enjoy themselves too! So give them a call before you make your reservation for the best plan. When you think ‘resort’ the most common image one gets is that of pretty villas, a pool, good food and some good old pampering. That’s exactly what Eagle Ridge offers. With both day packages (for those mid week blues) and over night stay packages if you’d like to indulge for a bit longer. All their plans include food, and their overnight plans include breakfast. The activities offered are basic indoor and outdoor games, swimming, and cycling around the 6 acre property, so we’d recommend Eagle Ridge if you need a low-key mini-vacation. Feel happy and at home at this resort as they offer a variety of packages through the week and weekend. The rooms are designed as quaint cottages that provide a homey feel during your stay if you want something slightly adventurous, try their tent. Try your hand at any of the adventure games, or take a dip in the pool and end it with and end it with a nice massage at the spa. While they like to keep things simple, we think it’s great place to take those effortless vacay photos! For an experience with a touch of luxury, check out Holiday Village. Located close enough to get there within an hour, all their packages promise to pamper and leave you feeling ready to get back to the grind again. With neatly manicured lawns and luxurious (and comfy) rooms that face the lawn or pool, we’ll be surprised if you ever want to leave! Their day out packages include fun activities like ziplining, rock climbing and UV paintball! Planning to stay the night? All their overnight packages include breakfast in bed for that extra element of sleeping in. For re-living those childhood memories of frolicking around mango orchards in the summer and wondering where the day went when it ends, Mango Mist is the ideal resort. They have a variety of packages to fit any budget and duration, but we reckon you’d want to stay the night when you see the accommodation options. Be it, camping under the stars, or getting cozy with your partner in a jacuzzi (or pool), they got you covered. They also have the standard resort fare like sports and games if that floats your boat. 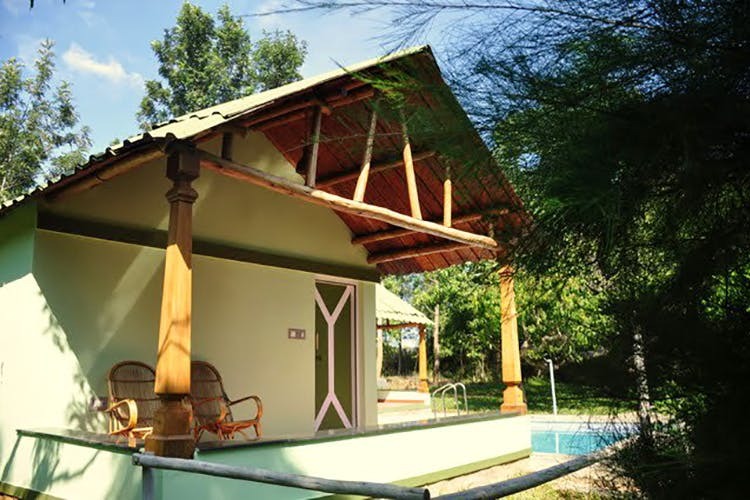 Another resort that shares its borders with Bannerghatta National Park, the resort offers a more low key affair in terms of their on site activities. It’s a great option for people who just want chill away from the hustle and bustle of the city in the lap of nature. If nothing else, you can finally live like a hermit in the woods for a while. As the name suggests, the place offers a retreat for all you tired city dwellers in the form of outdoor activities, and retire into a tent or a room reminiscent of summer camp days. Apart from the usual ziplining, rock climbing and all other outdoor activities, they also have provisions for boating and treks! Don’t worry, it’s not more than a kilometre long and perfect for that early morning bird spotting. You’ll surely have a fun day out at Wonder Valley as the entire resort is meant to be a giant playground for everyone whose young at heart. Be it bubble soccer or human foosball, you’re bound to have a whale of a time here. In between all the excitement and running around, you can also chill at the lake while kayaking. Stay the night at either a cute chalet or in a tent under the stars. Enjoy the immersive experience of living in the forest alongside nature. Choose between dorms for those group trips, wooden cottages, huts and tents depending on how close you really want to live to the great outdoors. Book a room just to soak in the natural beauty, or a package inclusive of a visit to the National Park, safari, and the butterfly zoo. Definitely make it a point to catch the sunset over the trees from their cafe rooftop! Since the property shares borders with the neighbouring forest, pets aren’t allowed for obvious reasons.